In general, the term albedo denotes the fraction of incident radiation reflected by a particle or surface. The shortwave (i.e., in the visible part of the electromagnetic spectrum where the Sun's radiation is concentrated) albedo of the Earth as a whole, and temporal and spatial variations in this quantity, are of fundamental importance in the global climate system. 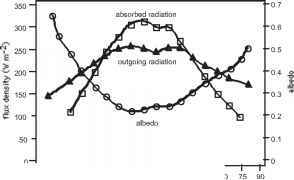 The planetary albedo is defined as the ratio of the total shortwave radiation reflected back into space to the total incident shortwave radiation; for the Earth this figure is about 30%, implying that about 70% of the incident energy in sunlight is absorbed by the Earth. This absorbed radiation is balanced by longwave (thermal infrared) radiation emitted by the Earth by virtue of its temperature. If the Earth had no atmosphere, the spatially and temporally averaged equilibrium temperature reached by its surface would be about -18°C. The presence of the atmosphere raises this average temperature, through the action of the greenhouse effect, to about +10°C. The 70% of the incident shortwave radiation that is absorbed by the Earth is distributed such that about 50% is absorbed by the Earth's surface, and the remaining 20% by the atmosphere. Heat transfer between the Earth's surface and atmosphere takes place through evaporation and precipitation, convection, and directly by longwave radiation. 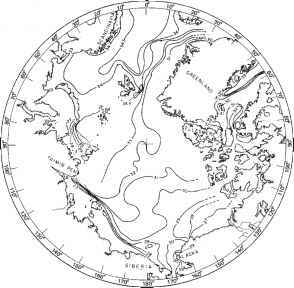 Variation of albedo with latitude. significant. The albedo of vegetated areas is low, typically 0.3 at most, not an unexpected fact since plants depend on the absorption of shortwave radiation for photosynthesis. Water surfaces also exhibit low albedo, down to 0.02 in the case of clear water. The albedos of exposed soil, rock, urban, and desert areas do not generally exceed about 0.4. However, the albedo of a snow-covered surface is significantly higher, and can reach about 0.9 in the case of freshly fallen dry snow. Consequently, there is a strong latitudinal gradient of albedo, illustrated by the figure above. The figure shows that the regions poleward of about 30° latitude are net emitters of radiation, the phenomenon becoming more pronounced as the latitude increases, while the tropical regions are net absorbers. The Earth's planetary albedo exerts a negative influence on the global mean temperature, since an increase in the albedo would result in a smaller proportion of the incident shortwave radiation being absorbed. Since a decrease in the global mean temperature would be likely to cause an increase in the snow-covered area, and hence in the planetary albedo, this mechanism constitutes a positive feedback, magnifying the effect and tending to destabilize the global climate system. The importance of this albedo feedback, among the many feedback mechanisms within the global climate system, is one of the reasons why it is particularly desirable to monitor and model the distribution of ice and snow at high latitudes.